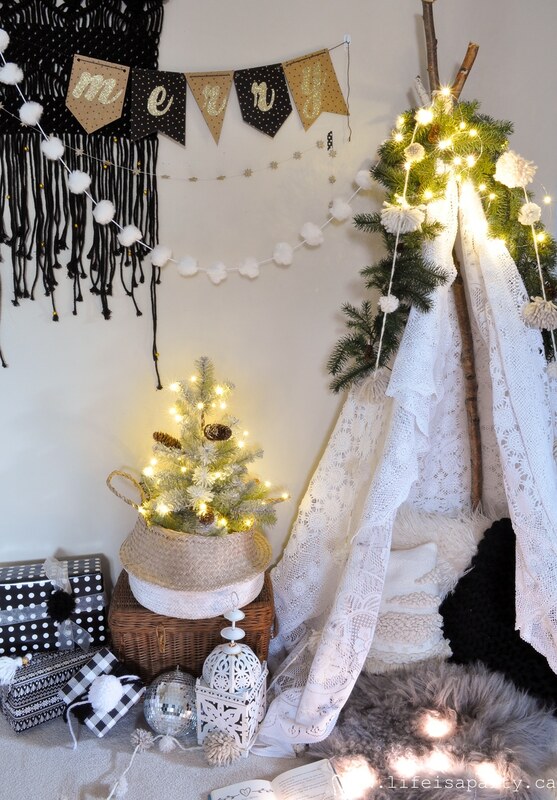 Boho Christmas Decor: decorated for Christmas with black and white boho style including lots of texture, tassels, pom poms, brass, wood, and twinkle lights. 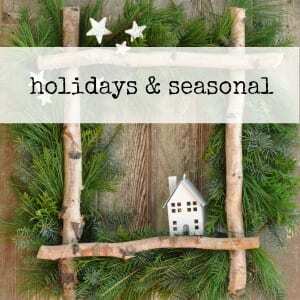 I’m excited to be sharing my Boho Christmas Decor with you today. 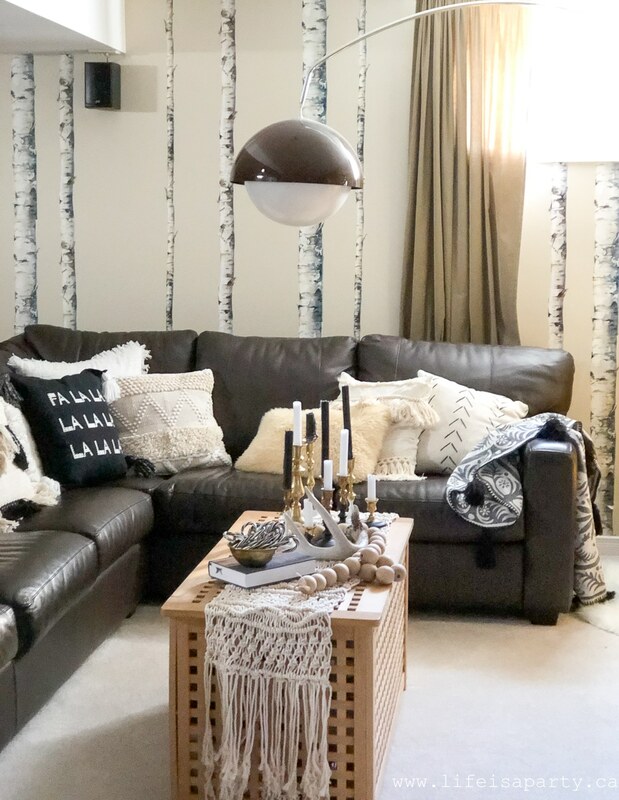 I’ve been working on decorating my basement family room all week, and today I’d love to give you a tour with all my finished projects. 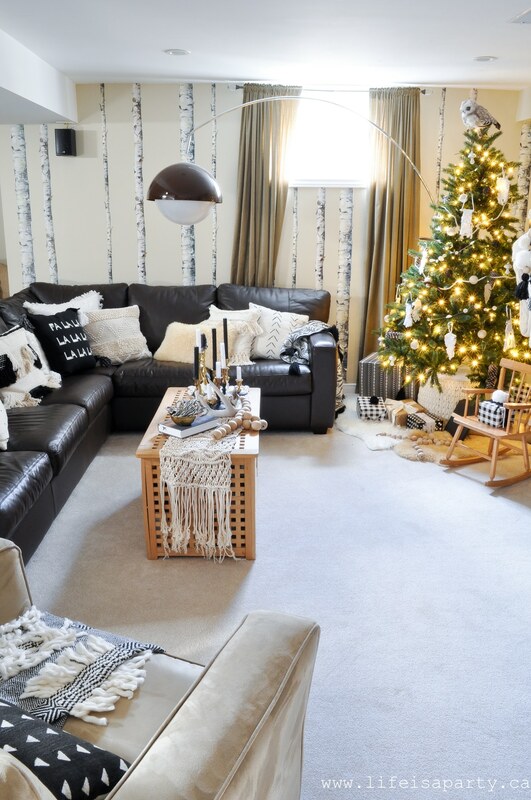 This room is one of our favourite spots for hanging out as a family. It’s so cozy with the fireplace on. We often watch movies down here together, especially at Christmas time. 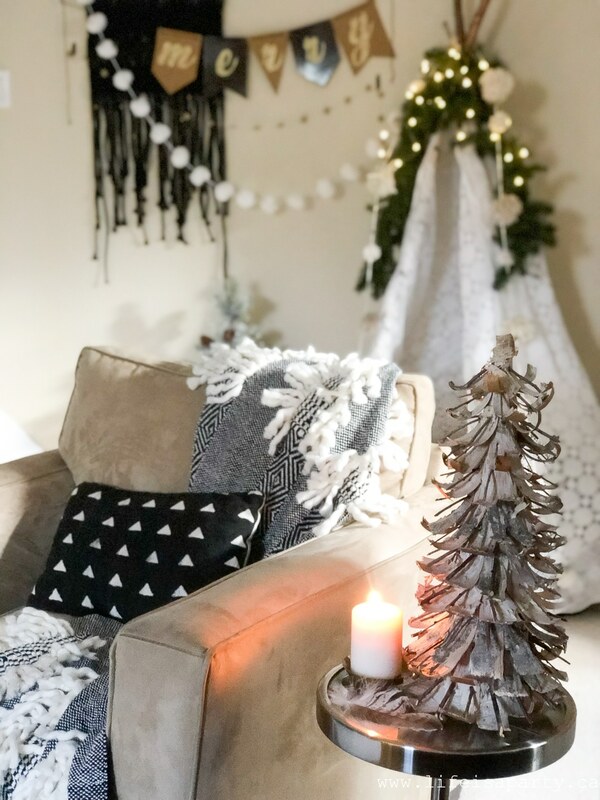 This year I thought it would be fun to do a black and white boho theme for the decor, and I absolutely love how it turned out. 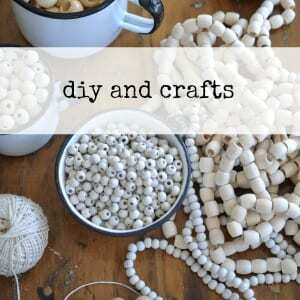 Most of the projects were DIY, and by using a lot of decor I already had, this years decor was very budget friendly. Let me start the tour with the centre piece of any Christmas decor, the tree. This beautiful Starlight Mountain 6′ Green Spruce Artificial Christmas Tree with 400 Clear Lights and Metal Stand is from Wayfair Canada and I love it. It looks so real, perfect for the boho look. And I love that it’s pre-lit. No more struggling with cords of lights for me. 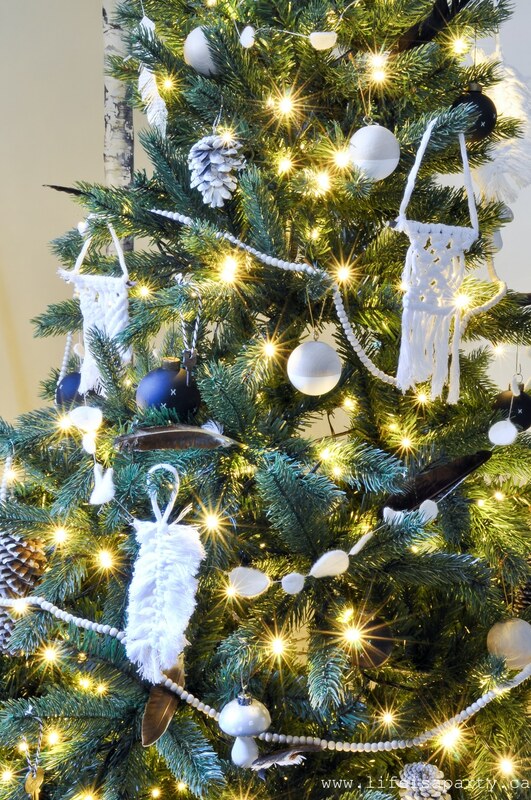 I decorated with lots of homemade decorations, like the little macrame ones. You can read all about the tree, with links to all the tutorials to make all the ornaments here. 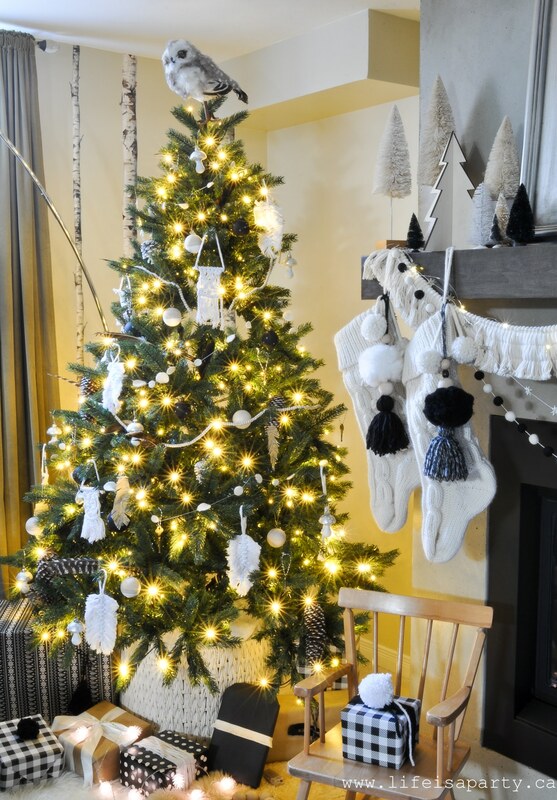 I set the tree up in a beautiful macrame basket, and added some sheepskin rugs to the base for lots of texture. The owl on top is the perfect finishing touch. I’ve wrapped all the presents in black, white and kraft paper so far. I love using yarn as ribbon, and little handmade tassels and beads as gift toppers. A feather tucked into the yarn, and some extra tassel fringe look great too. 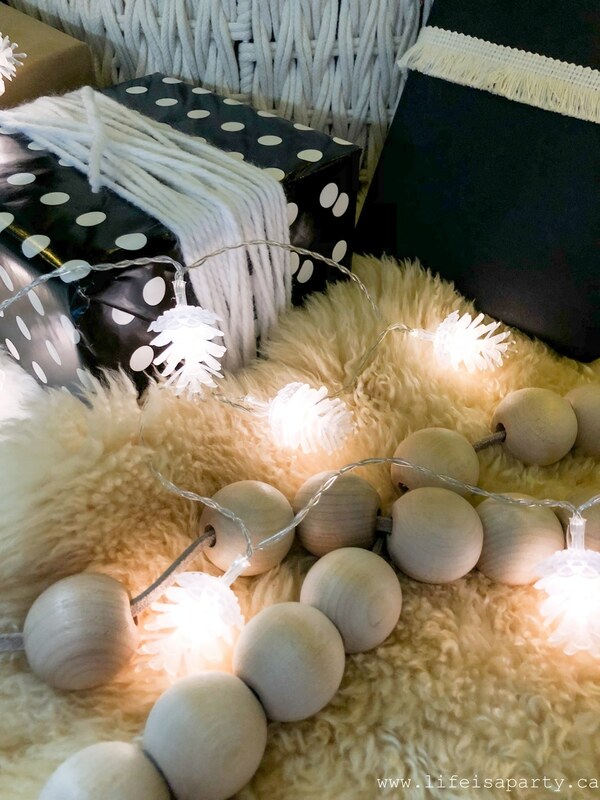 And how adorable are these pinecone lights? 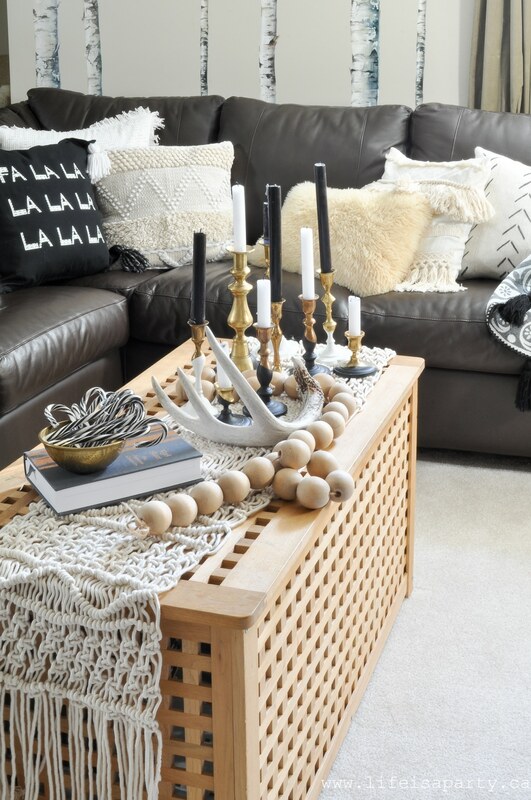 Over on the comfy couch we’ve piled on all the black and white cushions -with lots of fringe, tassels, and pom poms for the boho vibe. These cushions add so much texture to the space. 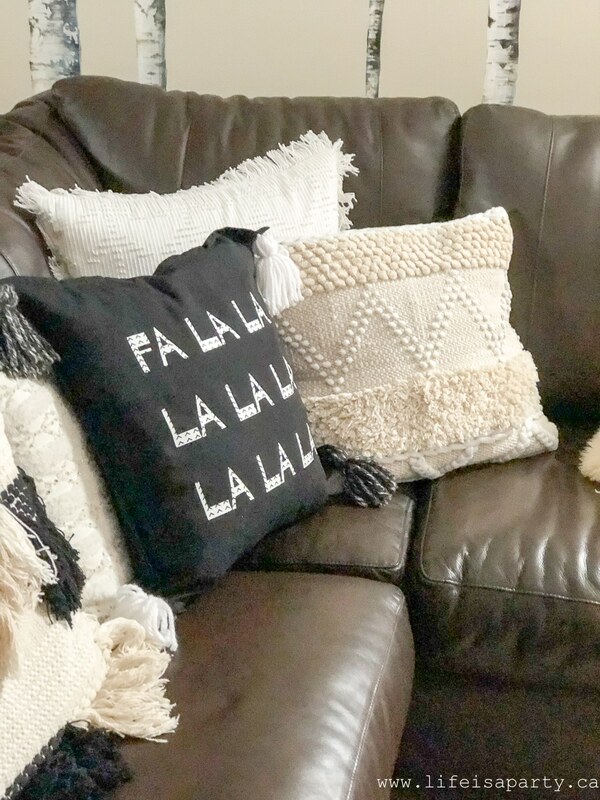 We made the fun “Fa La La” one and added some wooly tassels to it. You can see the full tutorial on how to make the Fa La La cushion here. In front of the leather sectional sofa, is a toy box/coffee table. 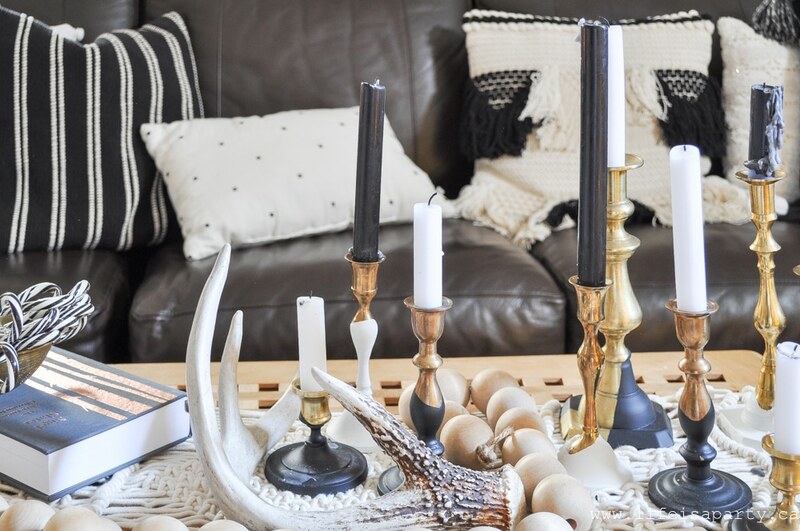 I’ve layered on a handmade macrame table runner, and then lots of paint dipped brass candlestick holders. I picked up all the candle holders at thrift stores and then painted them with a dipped effect, you can find the tutorial to make your own here. I’ve also added in an antler we found on a walk in the woods, and some wooden beads. The boho style loves to incorporate natural elements so these are both perfect. 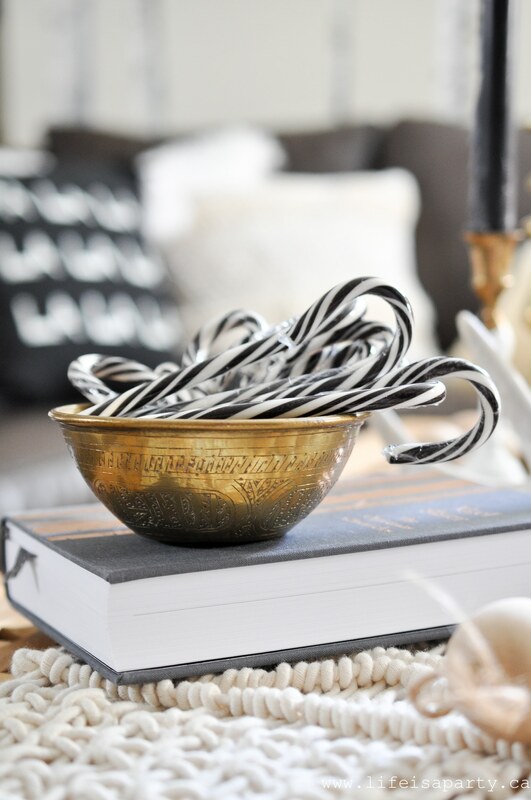 Boho also often includes brass and copper, so the candlestick holders, and this little brass bowl I found thrifting the other day are perfect. I filled it with some oreo candycanes. There’s also a book waiting for me to read it –Nigel Slaters “The Christmas Chronicles: Notes, Stories and 100 Essential Recipes for Winter”. It’s the kind of cookbook you really can read. 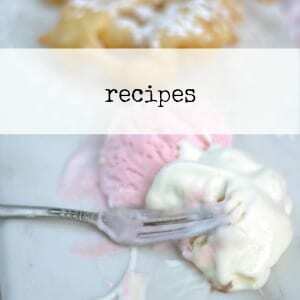 It’s filled with daily entries, sweet stories, and recipes to try for a delightful winter. It really stresses embracing the season of winter, and enjoying all the good it has to offer -good advice to someone who lives in Canada and hasn’t always loved winter in the past. I asked my husband for it for Christmas last year, and only got a chance to read a little. I’m looking forward to sitting down with it and a cup of tea soon. 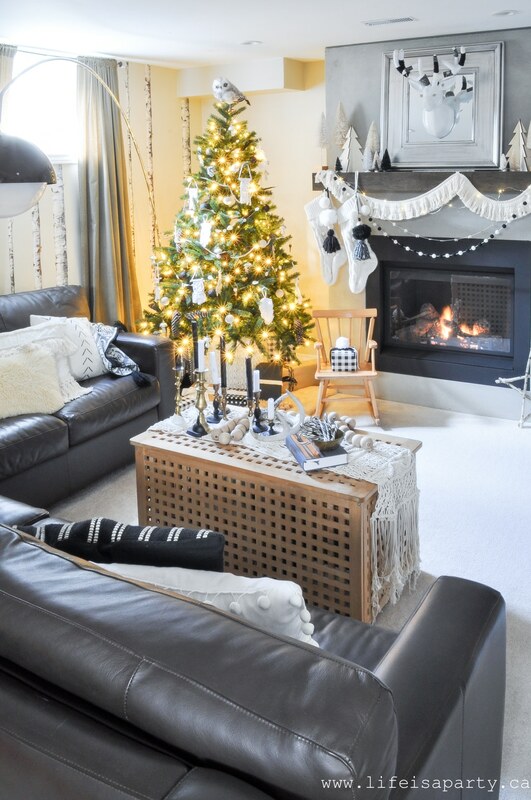 The fireplace is all dressed up for Christmas with lots of bottle brush trees, and a beautiful full fringe garland. 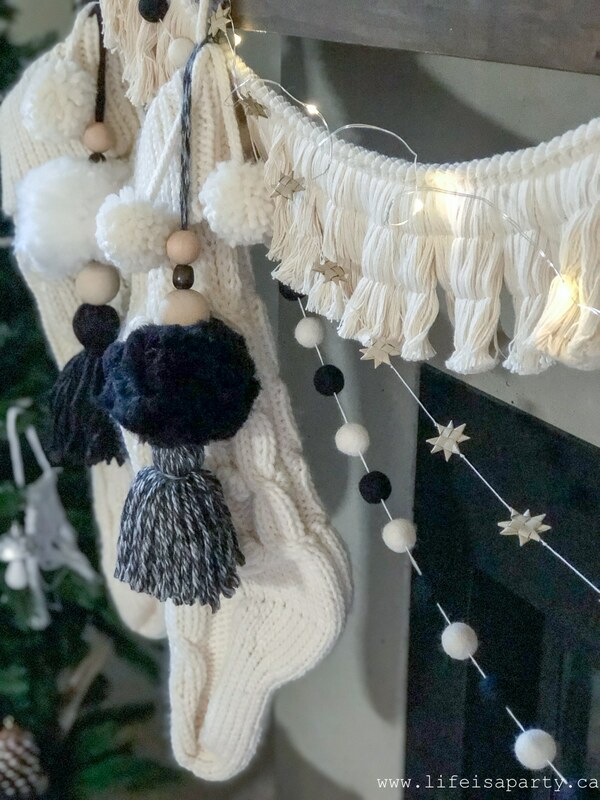 The stockings are looking great with their special tassels, I made from some yarn and wood beads -adding lots of boho charm. 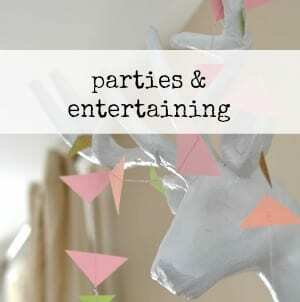 I love the paper mache deer head, and his boho makeover. I wrapped the antlers in yarn to add texture, warmth and interest. 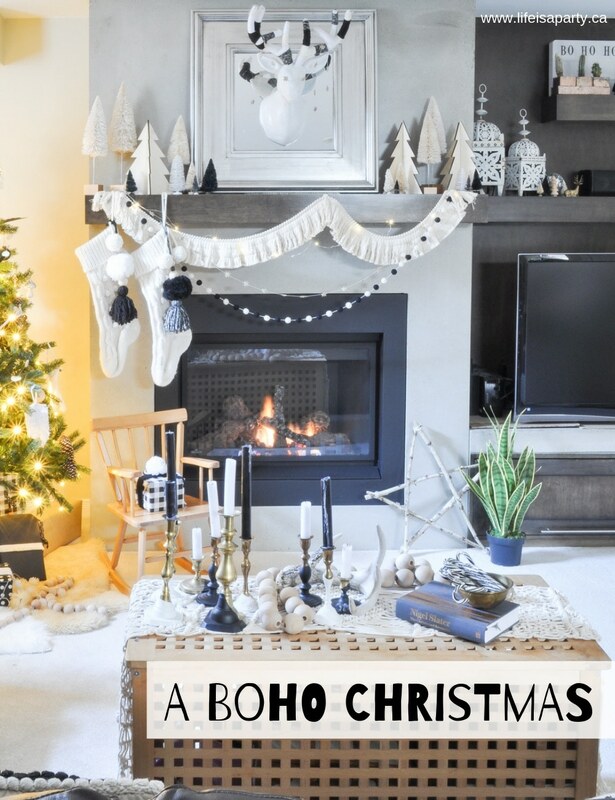 You can read all the details of the Boho Christmas Mantel here. Beside the mantel, the shelves continue into a tv unit. I’ve decorated them with some beautiful lanterns. One set feels very Moroccan. A well traveled, eclectic look is an important part of the boho look, so these lanterns are perfect. I’ve repeated the little bottle brush trees here, and added in a disco ball for a little eclectic fun. The “bo ho ho” light up box is another easy and fun addition to the space. 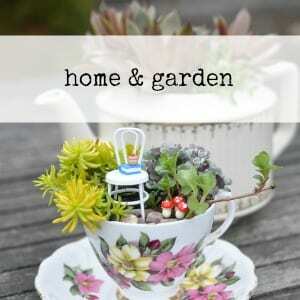 And just a couple of plants because boho always equals plants. Beside the couch there’s another comfy chair -a kijiji find years ago. It’s warmed up with a pillow and blanket. 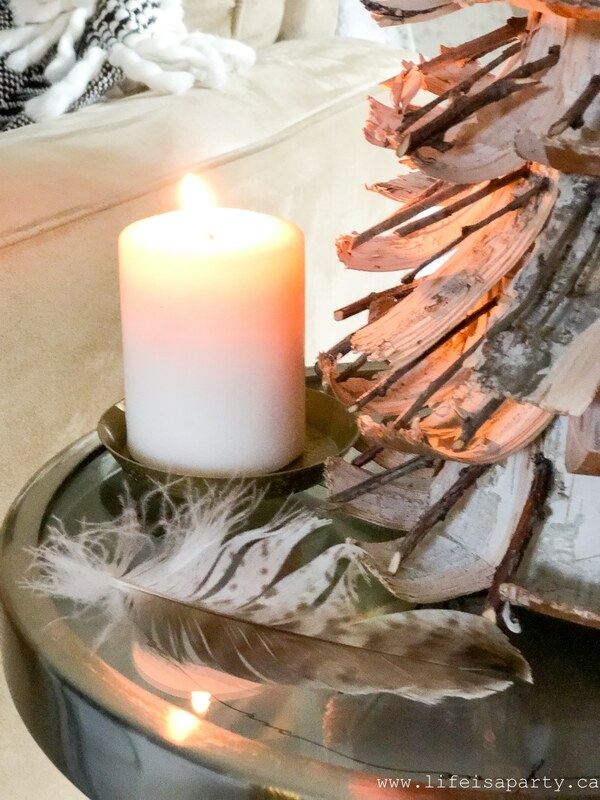 And on the side table a very simple arrangement of a birch bark Christmas tree, a candle on a vintage brass saucer, and a feather. What my sister always likes to call “simple perfect”. And last, but certainly not least behind the chair we created a fun little play and reading nook. I made the little boho Christmas reading tent out of some birch poles I cut down in the forest, and a couple of vintage tablecloths. 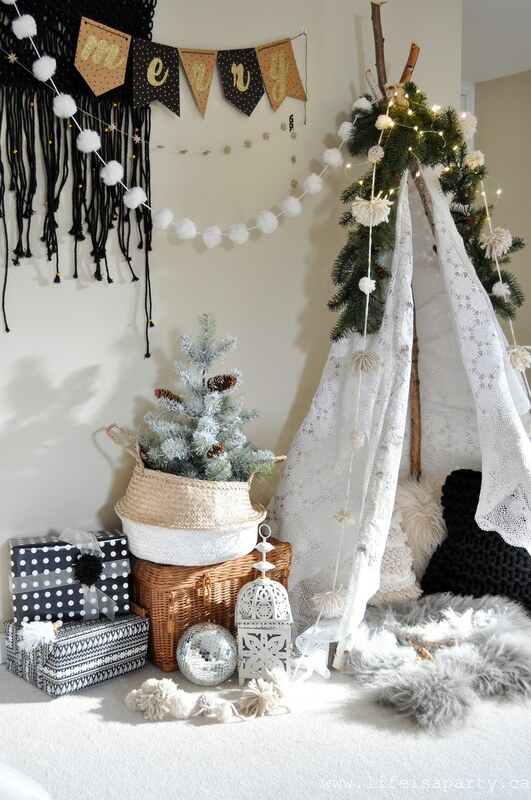 You can find the full tutorial on how to make the Boho Christmas Reading Tent here. It was a lot of fun decorating this little area. I layered in cushions and a sheepskin rug to make it cozy. I wrapped the tent in garland and fairy lights to make it a little more magical. 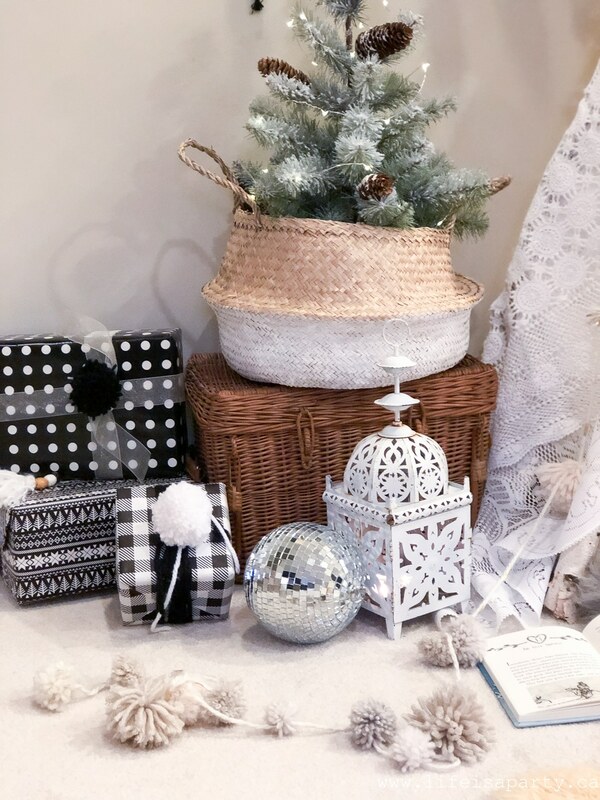 Beside it a used a wicker picnic basket as a stand for a little snowy tree. On the wall there’s a really pretty macrame wall hanging. It’s from the store 5 Below, and I sewed on some little gold bells to dress it up for Christmas. I love how this little project turned out. 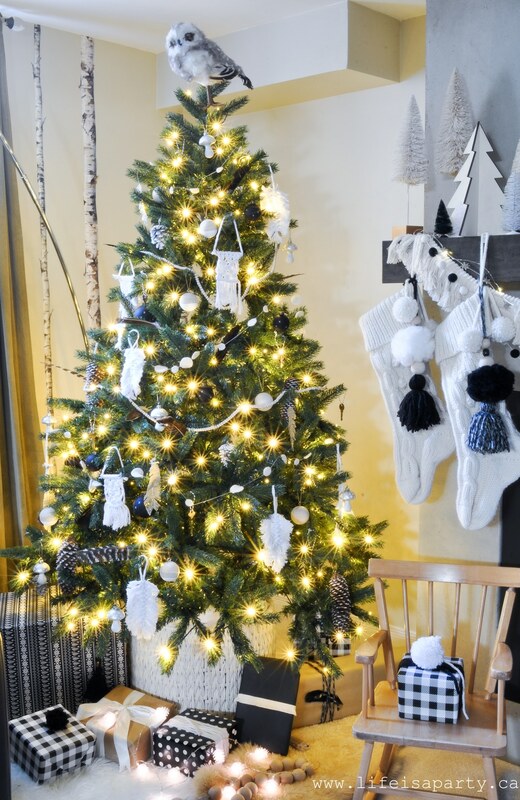 Also, I layered in lots of different buntings, from the soft, fuzzy pom poms, to the handmade straw stars. Layers = Boho and there are lots of layers here. 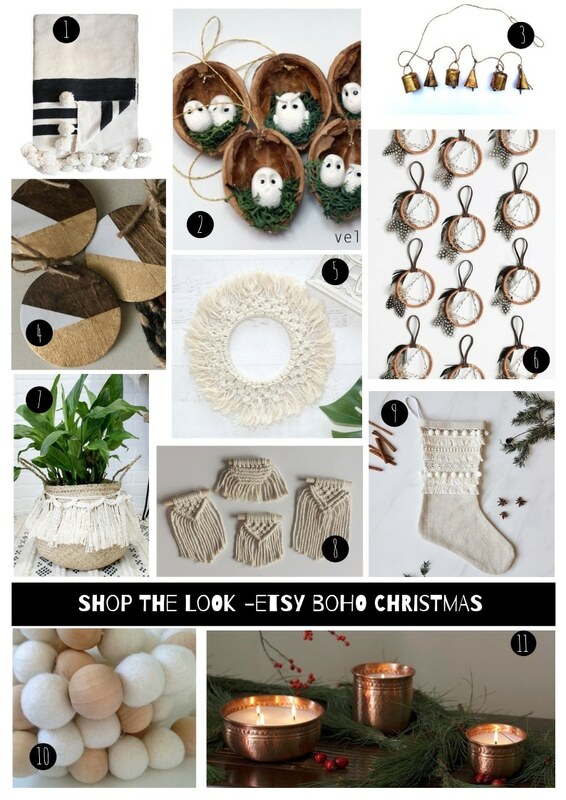 If you’re invested in creating the Boho Christmas look in your home this year, here are some beautiful Etsy finds to help. These are affiliate links, so at no extra cost to you, if you use my links I make a little from them. Thanks so much. 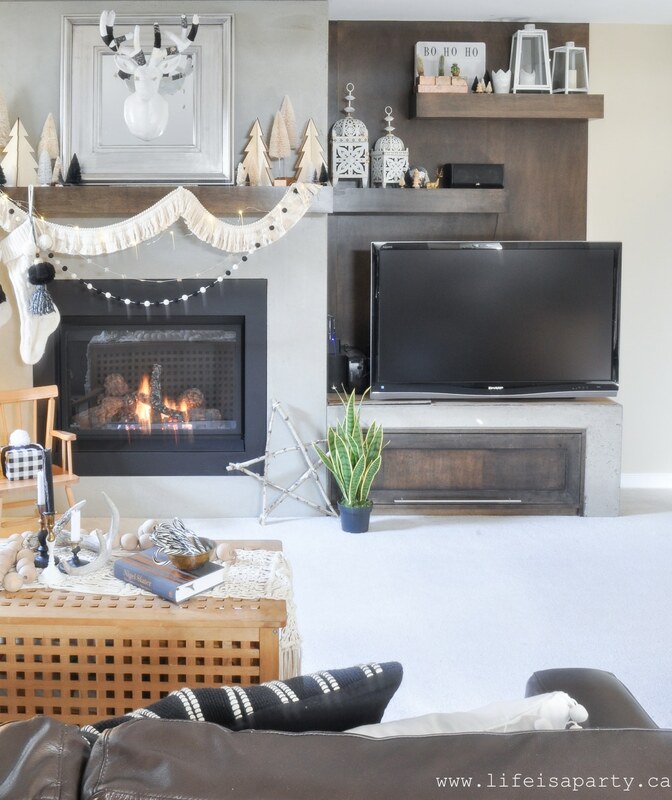 I am so pleased at how the Boho Christmas Deco turned out in the basement, and I can’t wait to enjoy the space with my family. 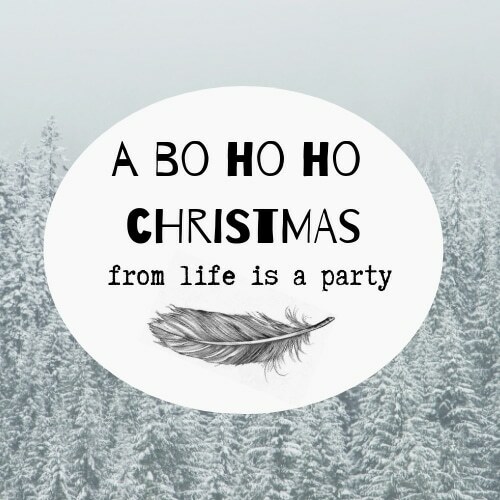 With a Boho Christmas, life really is a party!